In many countries, the data we need on girls and women doesn’t exist yet, or is imcomplete. For example, we don’t know the number of girls who leave school due to different reasons. We can’t close the gender gap without first closing the data gap. We are creating an independent data tracker with different partners. 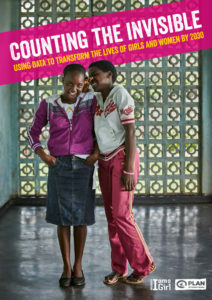 The tracker will measure progress for girls and women and help ensure governments deliver on the Sustainable Development Goals’ promises of equlity by 2030. The vision is simple: a world in which improved gender data inform the decisions and investments that can transform the lives of girls and women by 2030. Throughout, we will raise our woices on issues that matter and amplify the voices of girls and women – presenting ‘data with a soul’ by revealing first-hand insights into the barriers girls and women face and their experiences with overcoming these barriers.